Dodsworth is nervous. Sometimes Duck can be a little out of control. But Dodsworth's duck companion is surprisingly well-behaved during their visit to Tokyo...although he does fall into the koi pond at the Imperial Palace and becomes the center of attention at a Sanja Festival. What will Dodsworth do about his friend? So I picked this book out on a whim while browsing the library. It's the fifth in a series of Dodworth's travels (New York City and London and other such places) and I'm saddened to learn it's the last! 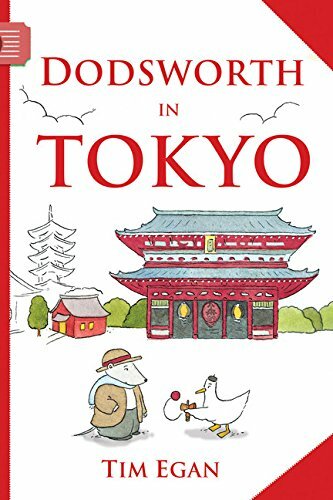 Yes, this book was fantastic in that it can tell an engaging story while also thoroughly educating a young reader about Tokyo customs and destinations. It's fabulous! I do wish Egan would keep writing about even more cities—especially such foreign ones like Tokyo where the customs would be so different. As for the writing, illustrations, and such...they're not the most exciting I've seen, but still good. The illustrations are rather understated and the sentences are pretty simple. It definitely higher level early reader (four chapters, lots of words on a page). Really, I enjoyed it for its educational elements and touches of humor (Duck doesn't know how to fly or swim—makes for some funny situations). I'd recommend it, especially for the travel-loving family! I will be reading the other four books, and crossing my fingers for more.